Now meet my “Afterthought” dress, the late to the party dress, the slow-slow-slow game-winner. It’s months since I made her but only now got around to wearing and writing about it! I’m currently in a phase of craving instant gratification I see a new fabric or pattern and I want to sew it now, but nagging away at me was the need to deal with my ufos – or UnFinished Objects. This fabric was a remnant of a beautiful Robert Kaufman print snagged from my local C and H Fabrics an indeterminate number of years ago. It was in the category of an “It’s so pretty that there must be something I can make with it.” item. Not my usual style at the time as I think it was in my most drab, work-wear phase in which everything was Plain, Muted and Unobtrusive. It was my ‘Black, Navy, Brown and Beige Period’. So this fabric was definitely in the #sewingdreams category. Some significant time after purchasing said fabric I eventually came to the conclusion that this needed to be a shirt dress. I don’t know why but that’s how I came to buy the Simplicity Lisette Pattern 2246. Then more time passed. At some point, I cut out the dress pieces and set them aside, probably missing something like interfacing for the plackets and collar. More time passed and the big sewing hiatus ensued. Finally, I snapped out of it and when I started sewing again, I said to myself I have to tackle this. Out from its prison of a plastic carrier bag and I assessed my earlier progress: side and shoulder seams had been sewn before I abandoned. That meant sleeves, a collar, a front placket, buttonholes (which I hate) and all the hemming and finishing still needed to be done. I put it on on a clothes hanger in my sewing area. I still didn’t dive in until it was approaching summertime again and I thought I really should get it finished. So out it came from where it had hung accusingly for the last few months and I finally cut the missing placket and faced it with iron on interfacing. This is, I now believe, what had stalled me in the first place. Piecing it together was relatively easy, I still had the thread but I hadn’t chosen buttons and despite having a mini stash of buttons (of course) I didn’t see the definitive button that cried out to go on this shirt dress. It was about now that I became aware that the #sewtogetherforsummer shirt dress challenge was just coming towards its last leg. I had seen it earlier in the year while travelling but not seriously thought about joining in – I didn’t think I would have time and I had once again forgotten the Afterthought. Then I thought “Hey – this is a shirt-dress” and when I re-read the details and it said any shirtdress anytime, I realised I could, after all, take part. The bits all came together nicely and was very pleased with my collar and just happy I was finishing it. I sewed the garment together and this is when I hit the big snag. When I put on this dress it was tight all over and once again I had to acknowledge that with the passing of time I have gained weight. Where once there was a curvy yet svelte figure, now I was a lot more ‘voluptuous’ shall we say. I had by now invested a fair bit of time into making this dress, I wouldn’t consider not finishing it and I was also invested emotionally in the idea of entering my first challenge. So the solution? Gusset! This great comedy word always seems to induce giggles (is it just me?) but the gusset is my dressmaking hero. 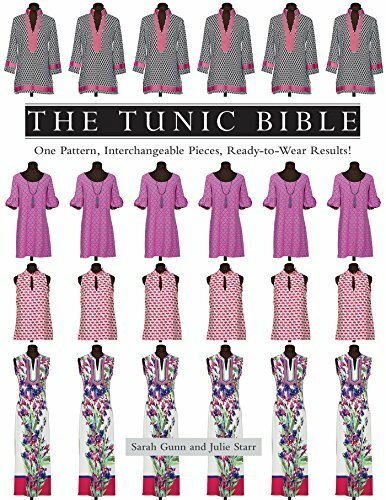 I needed volume and by inserting a 2″ strip in the sides and arms, I provided that volume and left me with a lovely comfortably fitting shirt dress. Work, holidays and visitors meant I was cutting to the wire as I often do, but the dress was finished in time to enter the challenge. Now I was super chuffed to have made it in time because I really wanted to participate, however, I was even more delighted when I found out my name had been drawn out of the hat to receive a prize, a copy of the Tunic Bible, by Sarah Gunn and Julie Starr. So this is how my ‘afterthought’ dress, my long abandoned unfinished object became a superstar (in my wardrobe anyway) and this is why we should all look again at those little-neglected bundles in the bottom of draws or scrunched up in carrier bags and say to them, you deserve to be finished. Works nicely as a duster too. I’m really interested to hear what unexpected bonuses have you received through your craft?